As experienced in the U.S., these two worldviews may be expressed as variations, for instance, as either liberal centrists or conservative centrists (the former Democratic and Republican parties), and also as progressive liberals (think Bernie Sanders) and regressive conservatives (think religious fundamentalists). Libertarians appear to slip back and forth between these positions, depending on issues. There’s little doubt that ongoing conflicts between these two major worldviews (or ideologies) are accelerating, both in the U.S. and worldwide, thanks mostly to expanded communication networks, including the Internet, cell phones, and social media. The problem is that it is growing so bitter that the metaphor of war appears to have caught on, largely due to the hateful, thoughtless, and harmful rhetoric that Trump has helped make common fare. So what I propose is that we citizens consider the conflict of world views as more of a healthy competition, rather than waging ongoing battles in a unwinnable war that will inevitably lead to the demise of civilization and destruction of our planet. Proponents of all worldviews should be able to compete in the world arena according to sensible game rules, such as: 1) All public communications, spoken or written, shall be presented in a civil manner; 2) All information (data, statistics, reports) shall be based on accurate and documented sources (no fake news or alternative facts); 3) All participants will refrain from underhanded machinations to advance their agendas (cheating, corrupting, lying, etc. ); and 4) All supporters of worldview teams will also abide by these game rules. The referees for these ongoing contests between conflicting worldviews will consist mostly of the free press, notably those recognized for honest, accurate, and balanced reporting, like NPR and the BBC networks, and major newspapers like the New York Times and The Washington Post, among others. By all means, FOX News is not to be considered a reliable source of information. Public opinion also provides a legitimate way of assessing all parties’ worldviews, but popular public opinions should carry less weight than educated evaluations by notable experts and organizations. Now that our nation has survived a year of regressive policies administered by an authoritarian, single-minded regime, there’s growing evidence that a majority of Americans disagree with the current trajectory of our government, and are committed to making major changes in coming elections. So let the games begin! 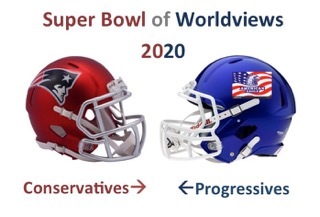 The more skirmishes and games won in the next three years, the more likely that progressive concepts (with 20/20 vision) will win the Super Bowl of Worldviews in 2020. And should it come true, keeping the trophy will require a continuing competitive race to stave off regressive ideologies —if we are to avoid societal descent, or, worse, collapse. > Resource Insights: Resource Insights: Protagoras And The Anthropocene: Can Man Still Be The Measure Of All Things? (Kurt Cobb). It is not surprising that humans look to themselves as arbiters of what’s important in the life and processes of the biosphere. Humans, like every other species, seek their own survival and wellbeing first. But our overreliance on humans as the measure of all things is the very posture, which has put us on the road to potentially catastrophic changes in climate and other planetary systems, changes that threaten our very survival. > Climate Code Red: What We Learned About The Climate System In 2017 That Should Send Shivers Down The Spines Of Policy Makers (David Spratt). The U.S. government agency, the NOAA, reported that there were 16 catastrophic billion-dollar weather/climate events in the USA during 2017. If climate policymaking is to be soundly based, a re-framing of scientific research within an existential risk-management framework is now urgently required. This must be taken up not just in the work of the IPCC, but also in the UN Framework Convention on Climate Change negotiations if we are to address the real climate challenge. > Common Dreams: Nuclear Annihilation And The Wisdom Of Mass Salvation (Robert C. Koehler). Is not the first step toward wisdom—when it comes to a world still preposterously armed with weapons of mass destruction a national and international commitment—never to dehumanize a living soul? With such a commitment in place, the obvious next step is committing never to launch a nuclear weapon, and therefore agreeing to get rid of the ones we have and, of course, refraining from developing new, more “usable” generations of nukes. > Resilience-Feasta: Ethical Disconnection And Re-Connection – Corporations As “People” And NGOs (Brian Davey). In this chapter of his book Credo, Brian Davey describes the mechanisms that allow corporate actors to distance themselves from responsibility for their anti-social and anti-environmental choices; for example, the role of corporate personhood and evasions of regulation, taxation and control. NGOs (Non-Government Organizations) and CSOs (Civil Society Organizations) have evolved to counter unethical corporate choices. Unfortunately they are often co-opted and neutralized. > ROAR: Organizing On A Sinking Ship: The Future Of The Climate Justice Movement (Kevin Buckland). As our planet rockets into a new geological epoch, we find ourselves on unfamiliar terrain. The only thing that is certain is that no one knows what will happen, and no one is in control. The rest of our lives will be defined by an exponential ecological entropy that will increasingly destabilize both the economic and political foundations upon which the modern world has been built. All bets are off. The collapse will be anything but boring. > Yes! Magazine: When Economic Growth Indicates Failure (David Korten). Research suggests that for most countries economic performance on equality is far more important to the wellbeing of their citizens than GDP growth. Indeed, in our currently overstressed world, in which humans are consuming at a rate 1.7 times what Earth can sustain, our real need is for less consumption and more equity. For the wellbeing of most everyone—including the rich—equality is more important than growth. > Green Tech Media: IRENA: Global Renewable Energy Prices Will Be Competitive With Fossil Fuels By 2020 (Emma Foehringer Merchant). According to a new report from the International Renewable Energy Agency (IRENA), all types of clean energy—which in IRENA’s definition includes bioenergy-for-power and hydropower—will fall within the cost range of fossil fuels in the next two years. That ushers in a “new age of renewable energy”. “This new dynamic signals a significant shift in the energy paradigm,” stated Adnan Amin, IRENA’s director-general. > Houston Chronicle: Cold Snap Gas Withdrawals Set All-Time Record (Ryan Maye Handy). The cold snap that kicked off 2018 triggered the greatest withdrawals of natural gas in history, with storage decreasing by a net of 358 billion cubic feet last week, according to the U.S. Department of Energy. That withdrawal surpassed the previous record of 288 billion cubic feet set four years ago, when an arctic weather pattern known as the Polar Vortex hit the East Coast. This time, frigid temperatures from New York to West Texas filled gas pipelines to the max as natural gas demand shot up. > The Hill: Zinke Talks With More Governors About Offshore Drilling Plan (Timothy Cama). Interior Secretary Ryan Zinke has so far spoken with seven governors to hear their objections to his plan to open the Atlantic and Pacific coasts to offshore oil and natural gas drilling. Nearly every other Atlantic and Pacific governor jumped on the Florida announcement to demand that they, too, be removed from consideration in the Interior Department’s plan for drilling rights lease sales between 2019 and 2024. > ENSIA: Has The Time Finally Come For Offshore Wind Energy On The Great Lakes? (Andy Baloaskovitz). Eight miles north of Cleveland in Lake Erie, the Icebreaker Wind project is poised to become the first offshore wind project in the Great Lakes. Pending federal and state approval, developers anticipate construction will begin in 2020 on the six-turbine, 20.7 MW project. Conservation groups are closely watching the Icebreaker project, which could provide some first-of-its-kind data on wildlife and bird migratory patterns and how they are impacted by turbines in the Great Lakes. > NPR: Here’s Just How Little Confidence Americans Have In Political Institutions (Dominic Montanaro ). One finding from the latest NPR/PBS NewsHour/Marist poll shows that trust is crumbling in the institutions that have been the pillars of U.S. politics and capitalism. There is limited confidence in its public schools, courts, organized labor and banks—and even less confidence in big business, the presidency, the political parties and the media. The only institution that Americans have overwhelming faith in is the military, with 87 percent claiming a great deal or quite a lot of confidence in the military. > NBC News: Flu Stresses Hospitals, Shows We’re Not Ready For Emergencies (Maggie Fox). Think hospitals are under a strain now, from a slightly bad flu season? Wait until a really bad one hits. Experts agree the U.S. is not ready for a bad epidemic, or even for some other disaster that would affect hospital supplies. And funding cuts mean even a little strain has a bigger impact than in years past. Influenza specialists say repeatedly that the chance of a new flu pandemic is 100 percent. > La Crosse Tribune: Organic Valley Leads Charge For USDA To OK Animal Welfare Standards (Mike Tighe). Protecting the credibility of organic brands and humane treatment of animals—especially chickens—prompted La Farge, Wisconsin-based Organic Valley to co-sponsor a full-page ad in The Washington Post objecting to a Trump administration plan to scuttle rules on the issue. A key element of the rule stipulates that producers must provide animals with daily access via exit doors to the outdoors and that outdoor areas include vegetation and/or soil. > Common Dreams: Congress Just Passed A Terrible Surveillance Law. Now What? (Neema Singh Guliani). Thursday Congress missed a historic opportunity to reform an unconstitutional surveillance law, instead passing a version that makes it worse. Both Democrats and Republicans deserve sharp criticism for continuing to allow the NSA to engage in mass, warrantless spying. The last few weeks have demonstrated that bipartisan efforts to reform our surveillance laws continue on an arc of progress. With only two more votes, reformers could have halted this bill from advancing and forced a floor debate over badly needed improvements. > Resilience-REAP: Our Schools Are Doing Too Much To Save The Planet (Katherine Stavrinou). We may be meeting our schools’ curriculum targets, but in many cases we are still missing the larger aims of environmental awareness, our essential inter-connectedness and inter-being with the planet we live on, And thus many teachers, and their students, are not acting out of deep ecological understanding or deep ecological commitment. I advocate a new approach in schools that fully embraces deep ecology, an approach that will stimulate inter-connectedness within our own selves and in inter-being with nature. > Common Dreams: To Save Oceans And Planet, Greenpeace Backs Plan To Create Largest Protected Area On Earth (Julia Conley). Greenpeace is launching a campaign on Monday to protect nearly 700,000 square miles of seas surrounding Antarctica, aimed at safeguarding ecosystems from fishing industries. First proposed by the European Union, the Protect the Antarctic campaign would create the world’s largest wildlife sanctuary, banning all fishing in the Weddell Sea and around the Antarctic Peninsula. > The Conversation: Home Biogas: Turning Food Waste Into Renewable Energy (Samuel Alexander). In an age of worrying climate change and looming fossil energy decline and the benefits of home biogas systems are obvious. Biogas is produced when organic matter biodegrades under anaerobic conditions (that is, in the absence of oxygen). This process produces a mixture of gases—primarily methane, some carbon dioxide and tiny portions of other gases such as hydrogen sulfide. When the biogas is filtered to remove the hydrogen sulfide, the resulting mixture can be burned as an energy source for cooking, lighting, or heating water or space. > Resilience: The Commons Transition Primer Demystifies And Delights (David Bollier). You are not likely to encounter a more welcoming set of texts and infographics to introduce the commons and peer production than the Commons Transition And P2P: A Primer website. The new site features four types of materials suited different levels of interest: short Q&A-style articles with illustrations; longer, in-depth articles for the more serious reader; a library of downloaded PDF versions of research publications by the P2P Foundation; and a collection of videos, audio interviews and links to other content. > Alternet: A Powerful Economic Justice Movement Is Brewing, Even In This Dark Time (Frances Moore Lappé, Adam Eichen). Today’s dire threats to our democracy arose from a narrative that based on a deep distrust of human nature. So we need to nurture an evidence-grounded causation story—one aligned with the rich complexity of human nature and with the three essentials we need to thrive: 1) a sense of personal power; 2) meaning in our lives; and 3) connection with community. And only inclusive, accountable democracy has a chance of making these possible. > MN Department of Health: Climate and Health 101 Webinar, as posted on our webpage with information (registration links, copies of the PPT deck and webinar recording).